For Bethany iCare, and Julie & George Woodford's Adoption. Fundraiser for Bethany and George and Julie. 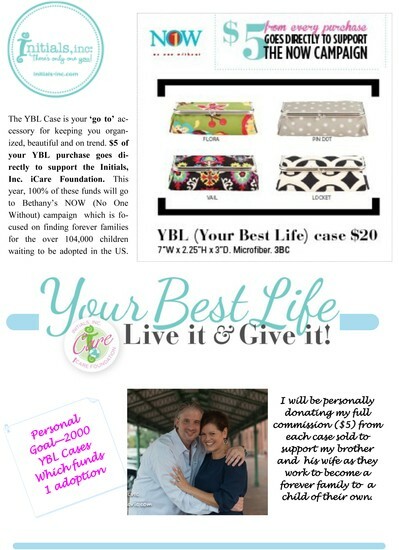 It's National Adoption Month and I am offering George and Julie my commission on each Your Best Life Case sold ($5). If I sell 2000 of them that equals $10,000 towards their adoption as well as funding an adopton with the Bethany iCare Program sponsored by Initials Inc. Thank you so much for agreeing to partner with me in my efforts to make a difference in NOT one, BUT two families lives. Choose "shop now" in the column for "Julie & George Fundraiser". If you know anyone who purchases gifts for staff members (Doctors, Dentists, Corporate) please pass the flyer along. Pass it along to any friends and family. Gift giving AND two great causes. I give referral gifts if you pass the fundraiser idea on to someone else and they gather orders as well.